JOENSUU, Finland--(BUSINESS WIRE)--The winners of the innovation competition organised by the City of Joensuu, Finland have been chosen. Four solutions will be implemented in Joensuu city centre during the next 12 months, developed by Parquery from Switzerland, Leapcraft from Denmark, Risto Takala consortium from Joensuu, Finland, and Ctrl4 Enviro from Spain. The chosen cases range from city lab approach to computer vision applications for parking space detection, traffic and crowd monitoring as well as energy optimisation in a swimming pool. In addition, an artificial surf wave will be tested in the river running through the town centre. The City of Joensuu’s innovation competition searched for feasible solutions for four different challenges, each with a budget of 50,000 euros. There were 19 submissions in total. In the City Lab Approach, Leapcraft’s solution provides and communicates comprehensive information about the air quality, traffic and weather conditions such as wind speed and direction. “Our ambition is to help Nordic and global cities to improve air quality and implement new technology, and we saw this competition as a good opportunity to do so. We look forward to the opportunity to deploy our solution in a new interesting city”, said Operations Manager Anne Cecilie Duus Kühnel from Leapcraft. Parquery’s computer vision -based application provides real-time information about parking and free parking spaces. Parquery is a spin-off from ETH Zürich. “Winning the competition is extremely valuable for us, in particular by giving us the opportunity to showcase our solution in the City of Joensuu. We believe that the Finnish market is extremely advanced in terms of smart cities and therefore an ideal target market for Parquery”, says Andrea Fossati, CEO of Parquery. The artificial surf wave is based on a patent of Aalto University, Helsinki, Finland, and will be the first of its kind to be tested. 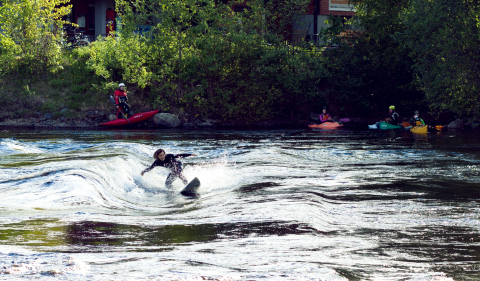 The wave would make Joensuu a unique surf destination. “We are happy that the City of Joensuu is bold enough to also support a bit more daring innovation”, say Risto Takala and Jarmo Laine who are behind the artificial wave proposal. Ctrl4 Enviro’s computer vision -based application will result in a smart swimming pool and smart market square. The real time data on the user amounts enable to optimize the energy, water and chemical consumption in swimming pool – and the activities in the market square. City of Joensuu arranged the competition in order to find new and innovative solutions for developing the city and public services. In addition, City of Joensuu wants to boost region’s innovativeness and internationality through public procurement and cooperation. The initiative is supported by the Urban Growth Agreement of the Finnish Government and especially the Ministry of Economic Affairs and Employment. Joensuu is a university town and growing regional centre in the eastern part of Finland. The town has one of the most ambitious climate targets in Europe: to be carbon neutral by 2025. One third of the population is less than 25 years old and there are more than 20,000 students in the town. City population totals up to 76,000 and that of the nearby region 120,000. Joensuu core competencies are forest bioeconomy, education, photonics, ICT, metal industries and new materials. European Forest Institute, an international science-based organisation is also located in Joensuu. The town has a strong policy for innovative public procurement, investments and solutions. Joensuu is located in the heart of the Finnish Lakeland, and lies on the waterfront and in the middle of dense forests. Core of the town is a vibrant pedestrian area and market square, which is currently undergoing a major renovation. In this part of the world weather conditions include four seasons, and snow cover lasts on average five months. In the summer it hardly gets dark, and the official Finnish heat record of 37.2 degrees Celsius was measured at Joensuu airport in 2010. Winners of Joensuu (Finland) City Challenge innovation competition are announced: Parquery AG, Leapcraft ApS, Ctrl4 Enviro and Surf Joensuu.